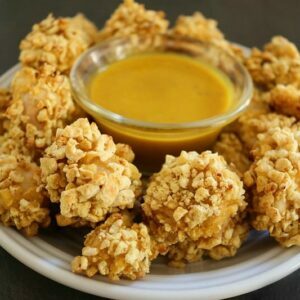 Your kids will go crazy for this popcorn chicken once they see that you use CEREAL as the main crunch component! Whisk egg, milk, honey and mustard in a small bowl. Set aside. Add flour to a second bowl. Crush cereal in food processor or bag. Add to a third bowl. Dip chicken pieces into egg mixture, dredge in flour, dip back into egg mixture, coat in cereal. Place on a sheet pan that has been drizzled with Olive oil. Bake for 15-20 minutes or until golden brown and 160 internal temperature. Serve with honey mustard dipping sauce- combine additional honey and mustard into a small bowl.